A growing number of private and professional entusiasts are dedicated a substantial part of their time searching for traces linking back to our World War Two history. Accross the globe remains are captured in the soil just below the surface, waiting to be found and brought to the surface after careful excarvation. The "Society", including a number of WW2 entusiasts, have a great interest in this particular search for the history and are collecting reports and in fact also do diggings them selves on the historical locations collecting the historical relics. Bullet by bullet, badge by badge, archaeologists and heritage enthusiasts have spent a year unearthing the secrets of a key World War II battle at Adam Park. Now, the finds and stories from the first battlefield archaeological dig in Singapore will be on display at an exhibition at the National Library Building. The events are among several to mark the 70th anni-versary of the fall of Singapore, on Feb 15. The quiet 8ha site off Bukit Timah Road was where four days of fierce fighting between British and Japanese troops took place in February 1942, just before the fall of Singapore on Feb 15 that year. 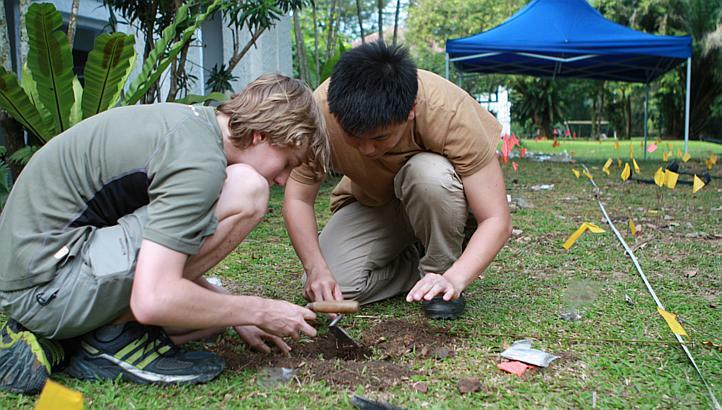 As if proof was needed that WW2 archaeology of high quality is to be found in Singapore the National University of Singapore Archaeology Team, led by Lim Chen Sian from the Department of South East Asian Studies, recently uncovered an old ARP trench. The discovery came while they were digging for 14th / 15th Century pottery on the Padang; the historic ceremonial area opposite the City Hall and Supreme Court, in the very heart of the city. 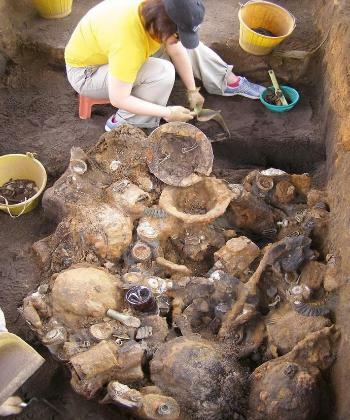 'It�s a stroke of luck that the ARP trench just happened to be in line of the series of excavation pits laid out by the team looking for traces of pre-colonial Singapore . It appears that the trench was turned into a rubbish pit by civil servants within the City Hall at the time of the surrender to the Japanese in 1942. For the most part, the artefacts consist of Mk V Respirators and steel helmets thrown into the pit, presumably after the ceasefire. All the respirators are date stamped either1940 or 1941. There was however no time or resource to get to the bottom of the pit and the intention is to cover up the site, earmark the location for protection and return to excavate it fully at a later date. There is of course great speculation as to what may be found at the bottom of the trench; perhaps items that were not meant to be found by the Japanese! The regular rain and constant moist heat is hard on any kind of iron, webbing, leather and different kinds of fabric materials. Decomposition process is immediately initiated if anything is left in the open or buried in the damp earth. 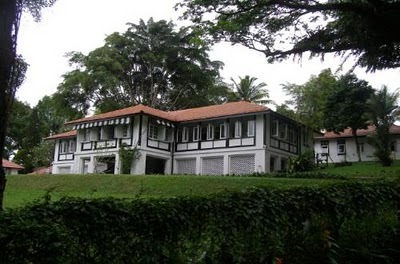 It was therefore quite extraordinary when a team of archaeologists and their assistants in Adam Park, Singapore, were able to find old English equipment buried, apparently immediately after the completion of the fierce battles between Japanese and British forces in 1940. The area was subsequently transformed into a POW camp and it is believed that there are more hidden in the humid tropical soil in the area as well as in the dense surrounding vegetation, although the condition of these effects found are marked by the tropical climate. Today there is, oddly enough, a Japanese restaurant in one of the historical "Black & White" houses in the area on the very spot where the Japanse after heavy losses made the heroic English forces to surrender. Left: The remains of a grenate. Note that the split is still in. Right. Close up on the split. Left: An British Army boot in a remarkle good condition considering the harsh tropical climate. Right: A good example on how the humid climate "eat" up webbing and any other form of fabrics. Left: British cartridges in a very good condition. Right: same caliber in another bad state. Left: The classic British water bottle and Right: a rusty Britsh Tommy helmet.